Members of the Rutaceae family and Citrus genus, Kumquats are more cold hardy than other citrus and have smaller fruit. The fruit rind is lacking citric acid, which makes it sweet and edible, but provides less protection against insects. Form: A shrub or small tree. Lifespan: Productive up to 50 years in a good location with proper care. Mature Size: 8-25' high and as wide. 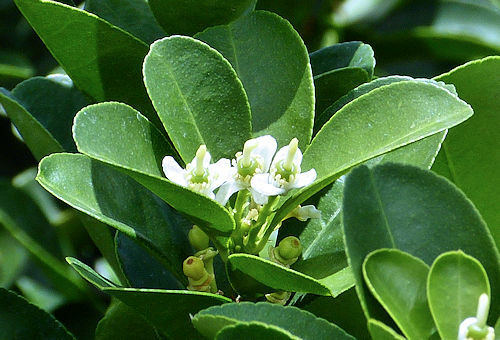 Flowers: White, five petals, sweetly fragrant, borne singly or in a cluster of three or four. Bloom: Mid spring into fall, or throughout the year in regions without freezes. Self-fruitful: All Kumquat cultivars self-pollinate. Years before fruiting: 3 years after grafting. Fruit: Oval or round, golden yellow to reddish orange, 1" to 1.5" diameter, sweet edible rind, tart to sweet flesh, entire fruit, except seeds are eaten. The seeds are a source of pectin. Months for fruit to ripen: 6, depending on cultivar and micro-climate. The fruit are ripe when fully orange with no trace of green. They do not ripen after harvest. Storage after harvest: At room temperature up to 3 days, or refrigerate up to 2 weeks. Leaves: Glossy green, ovate. Citrus leaves have a tendency to turn pale-green or yellow in cold weather. When temperatures warm back up in the spring, the leaves will green up. Stems: Few or no thorns. Densely branched. The bark is prone to sunscald if not shaded by leaves, especially in higher temperatures. Roots: Usually grafted on Trifoliate Orange (Citrus trifoliata) rootstock because its own roots do not allow it to flourish. 'Meiwa' - nearly round shape, sweet thick rind and pulp, sweetest tasting, 1.5" diameter. 'Nagami' - oval shape with sweet rind and tart pulp, unique sweet-sour flavor, eaten whole, about 1" diameter. This cultivar is more vigorous and hardy than others and grows faster. 'Nordmann Seedless' is a variation. 'Marumi' - round shape, sweet rind and pulp, intermediate sweetness between Nagami and Meiwa, 1" diameter, flesh can be dry. 'Fukushu' / 'Changshou' - a hybrid, possibly kumquat-mandarin, less cold hardy, oval with depressed apex, 1-1.5" long, sweet rind and tart pulp, thornless, spreading dwarf tree with larger leaves, 6-10' tall. Wildlife: Attracts bees, insects, birds, and is a food plant for the Giant Swallowtail butterfly caterpillar – see Pests, below. Mammals may strip the bark off of young trees, consume fallen fruit, or climb the shrub to eat the fruit. Toxic / Danger: Possible thorns. Heat tolerant: Less than other citrus members. Sun: In very hot climates, afternoon shade is necessary to reduce heat and water stress. Avoid reflected heat. Water after becoming established: Every one or two weeks minimum. Deep water twice a week to maintain fruit crop. Allow soil to dry out between waterings. Water may be needed more often in extreme heat. Soil: Well drained, tolerate of soil types, pH 5.6-7.5 (acidic to neutral) for best results. Fertilize: Do not fertilize the first year. Apply an organic fertilizer every month from mid-February to late September. Apply citrus micronutrients three times a year in February, May, and August. Do not fertilize after September to keep the plant from producing new growth that will be harmed by early frost. 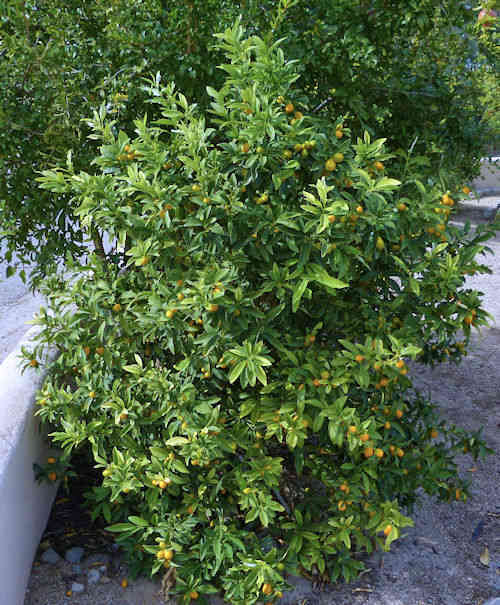 Kumquat trees are small and grow slowly, so they need less fertilizer than most citrus trees. These trees are prone to zinc deficiency, signaled by smaller leaves, reduced shoot length and possibly yellow blotches between green leaf veins, so application of citrus micronutrients is necessary. Mulch: With organic material all year to reduce water loss and reduce heat and cold stress. Keep mulch one foot away from the trunk. 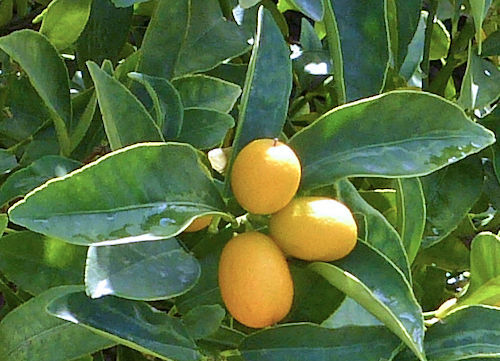 Planting: Kumquat can be grown in large containers. Indoors, in cold climates, the tree should be placed near a large, south-facing window. First Year Care: Do not fertilize. Water at least twice a week, but do not overwater. The soil must dry out between waterings. Prune: Remove any suckers growing from below the graft on the trunk. Remove crossing branches and shape in winter. If you prune up from the bottom to expose the trunk, you should paint the trunk with tree paint to avoid sunscald. Propagation: Cuttings grafted onto special rootstock. Seed does not grow true and ungrafted kumquats have very weak roots that cause them to grow poorly. Uses: Ornamental, edible fruit, jams, marmalade.